Our Disavow Links integration allows you to upload Google’s disavow file and hide all disavowed links from Ahrefs reports. 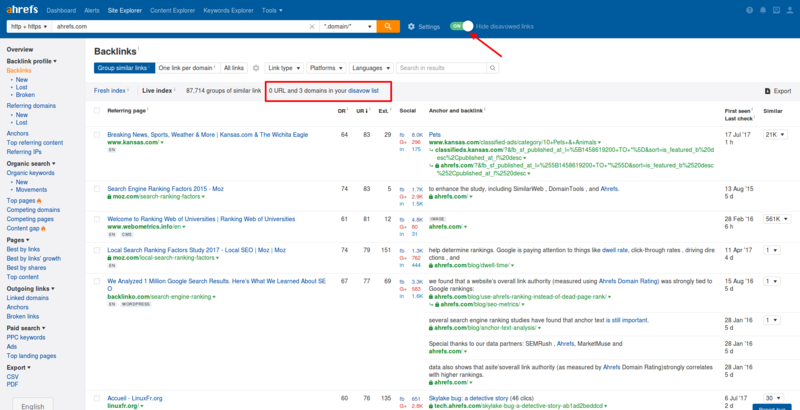 For instance, if you have disavowed links with Google and want to check your backlinks data taking into account those disavowed links, you upload this file to Ahrefs and check reports under 'Backlinks profile' menu. If the button "Hide disavowed links" is ON, disavowed links/domains won't be shown in our report. This functionality is available for all paid Ahrefs subscriptions. It doesn't change any processing. It's created for your convenience simply to hide disavowed links from our backlinks reports. None of Ahrefs ratings is affected by links you disavowed, same for all Overview stats. Disavowing functionality will only work for those domains/URLs you have added to Ahrefs Dashboard as projects. Why is there a discrepancy between the no. of disavowed links shown on the Dashboard and Disavow Links page?